This is a sampling of a collection of chants I've been writing since 1989. I have long wished to give some form to the music to share it with other women. 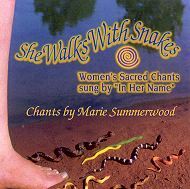 So Cherie and I gathered a group of friends and we've been chanting together In Her Name to record "She Walks With Snakes." We called upon our own passion to infuse this music with beauty. We chanted in sacred circle always. This music is sacred to women. I offer it for use in solitary work or in a circle of women. Use it to weave a container of sound for work together, and to create community as women gather all over the world to sing and open to our own power, our own beauty, and our own wisdom. 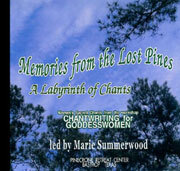 These chants were written in Bastrop Texas at a workshop called "Chantwriting for Goddesswomen". Marie Summerwood, musical artist and teacher of women's sacred music, led the day during which each of the 14 women present wrote her own chant. These chants were created to help Marie on her own journey, and to reclaim recognition of the inherent sacredness of women's powers of creation and nourishment, sexuality and old age. Blessed Be.